I always tell my clients to use as much professional photography on their website as possible. It’s one of the most authentic ways you can establish your visual brand and will look like you invested a million bucks on your website. But for some small service businesses this can be an issue. When you’re a therapist, lawyer, wellness coach, investment advisor, accountant the proof of your service is in the positive outcomes that get created for your clients. Yet, I’m guessing your clients aren’t going to be jumping and up and down, eager to pose for photos for your website. And asking them would be pretty weird. One way you can get around this is to commission a photographer to take photos of you at work, using your friends or actors to stand in as your ideal clients. Tell the photographer you need help staging shots that show you working and interacting with clients in as natural a setting as can be that represents your business. When that’s not possible, there’s stock photography. When I worked in magazine publishing, Getty was the go-to source for stock photos. They’re a premium service that charges a premium price, starting at about $175 for a single downloaded visual. What’s great about Getty is that you know you’re getting quality photography. 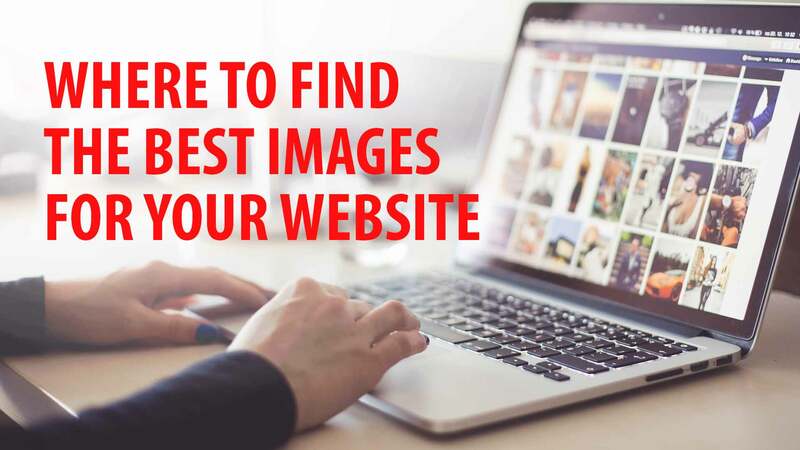 And because they’re more expensive than the average stock photo house, the chances of seeing your images on your competitors website and marketing campaigns is pretty slim. Shutterstock Premier is a direct competitor to Getty Images. It boasts of adding over a million new items every week for the freshest, royalty-free images, videos and music. And is used by major brands and advertisers like National Geographic, Marvel, and Simon and Schuster. Beautiful, high-quality content. They’ll even do the searching and sifting for you. Pricing? To find out you’ll have to fill out their online form and talk to one of their specialists. One of my go-to resources when I need traditional business images, iStock offers excellent quality for relatively reasonable prices. It offers two classes of images: 1) Signature which is excellent quality and 2) Essentials which is their value-oriented class of images. iStock’s pricing is based on a credit system where the better quality the image, the more credits you’ll need to buy the rights to use it. Pricing starts with a minimum of 1 credit for $12 and goes up to 300 credits for $2,400 (which comes out to $8/credit). The more credits you buy, the more you save. Or you can subscribe for a set period of time and download a pre-determined number of images within that timeframe. For their regular quality Essential images a one month subscription costs $40 and one year subscription costs $29/month. For access to all images—the regular Essential images and better quality Signature images—costs $99 for one month or $70/month for a year-long subscription. What I like: You can download any size image for the same number of credits. Meaning if the photo you’re interested in is priced at 3 credits, you pay just those 3 credits whether you need to download a small web image or x-large image meant for print design. Tip: I always download the largest possible file size because then I can use it for anything else later if I want. This is my other go-to resource when I need traditional business images. It works very much the same way iStock works where you search for the images you want and download watermarked versions to your desktop that you can work with in your designs, paying only when you’re sure the images work for you. Shutterstock also offers two kinds of pricing plans: prepaid image packs and annual plans, as well as a month-to-month plan. The prepaid image packs start at $29 for two images and go up to $229 for 25 images. Annual subscriptions start at $29/month for 10 images/month and go up to $199/mo for 750 images/month. And month-to-month plans start at $49/month for 10 images/month and go up to $249/month for 750 images/month. What I like: Consistent, reliable source of stock images, just like iStock. Stocksy is my favorite resource for business images when I’m not bound to a traditional business look. When my project is for a business that’s on the creative side or the client is trying to convey some playfulness as part of their brand this is a good place to look. Pricing is based on file size, starting at $15 for a small image that might be appropriate for smaller web use to $125 for an x-large image that would work for a larger layout print project. What I like: Besides the fact that Stocksy’s offerings are a bit less corporate, I don’t see the same models on Stocksy that I see on comparatively priced competitor sites Shutterstock and iStock Photo where you’ll find a bit overlap. There’s also an Instagram feel to Stocksy photos that I find really appealing. I’m amazed at the artistic quality of the photos on free stock images sites these days. Typically, the way the free sites work is that you get to pick and choose whatever images you want in exchange for a byline credit to the photographer. Although with some sites, this isn’t required. That said, giving credit to a photographer whose work you’re using on your website to get more business is the right thing to do. Don’t you think? The downside with the free stock image sites is that they’re popular. I grabbed a beautiful free image for a recent blog article and saw the exact same one in an email marketing campaign I received from a vendor only a couple of days later. My cool find suddenly lost its appeal. Always buy the largest sized image you can afford so if you decide later that you’d like to reuse that small web image on a print marketing campaign or as a larger full-width website banner, you can. Tip: it’s okay to make a large file smaller; it’s not okay to make a small file larger—the quality of the image will end up looking blurry / pixelated. In general, you’ll mostly want to use landscape oriented images (wide) for your website because they’ll work anywhere—header banners, and other full-width and wide images. Portrait oriented images (tall) should only be used at smaller sizes or grouped together with other portrait images to make a grouping that together, take up a horizontal or landscape footprint. Portrait images can also be layered on top of a horizontal background of patterns or solid color. Most of the time, you’re going to be using images that have a subject or main focal point, like a person or product. Usually, you’ll want to avoid images that are cropped in closely to the subject. Instead, find images where there’s a lot of ‘white space’ around the subject. White space, by the way, just means neutral background. For header banners on responsive websites you definitely want to use images where there’s plenty of white space around the subject. This way, when screen sizes change depending on the device your website visitor is using, the subject will stay mostly visible without heads getting cropped in odd places—not a great look. Choosing images with plenty of white space will help you avoid unpredictable and undesirable looks. Small (600x850px) for basic website use in articles, blogs, run-of-site images. Also for your digital marketing like email marketing campaigns and social media campaigns. Medium (1160x1730px) for backgrounds and some full-width banners. Large (1950x2925px) for full-width, full-screen banners. Also for print marketing campaigns. X-Large (2870x4300px) for large print marketing campaigns like posters and outdoor signage, and video marketing. It’s best to buy the largest images you can afford so you have the flexibility to crop and resize them in a way that makes the most sense for your design. And can reuse them for larger spaces or on other media that requires a bigger file. Once you’ve picked and purchased your images, and you’ve cropped and edited them until they’re just right, you’re going to want to optimize them for your website so they load quickly and don’t degrade your website’s performance. I’ll talk more and demonstrate this concept in a future post. For now, here are my favorite tools for optimizing images for web. ImageOptim: a free downloadable app for Mac that removes bloated file data out of images without compromising quality. tinypng.com: a free online drag and drop tool that compresses your JPGs and PNGs. WP Smush: a free WordPress plugin that does the work for you. There’s also a pro version with more bells and whistles. I’ve also created a video that’ll walk you through step-by-step How to Download the Best Quality Placeholder Images from iStock and Shutterstock. I believe you get what you pay for and images are no different. If authenticity is an important attribute of your brand, go with a professional photographer or shop one of the premium stock image sites, Getty Images or Shutterstock Premier. If looking professional and polished is important to your brand but you have budgetary constraints, shop one of the middle range stock photo sites like iStock or Shutterstock, or Stocksy if your brand is more playful and creative. If you’re business is just starting out and you have little or no budget, consider one or both of the free stock image sites, Unsplash or Pexels. I also like to use free images for my blog sometimes and my email marketing campaigns. Whatever you do, please don’t grab random images from the web or from Google. You’ll likely be committing copyright infringement and making yourself liable to a lawsuit. Not to mention that it’s just plain wrong to take other people’s stuff without their permission. There’s so much to talk about when it comes to images and I’ll do so in separate posts and videos. I really want to show you how to work with and edit images using Photoshop and Canva (an amazing online photo editor). Demonstrate how you don’t have to use images right out the box. And then save them out to the appropriate file format and size, and then optimize them for web. Do you have any favorite sources for images that aren’t mentioned here? Please let me know in the comments. Copyright © 2010–2019 Mary Maru Design. All rights reserved.